Miss Kitty was my mother’s cat. When she passed away, we tried to keep her in a home with another cat. They get along extremely well, but both Miss Kitty and the other cat have special dietary needs that are different from each other. We can’t keep the food segregated effectively. Miss Kitty needs to eat only Hill’s Prescription Diet Z/D for skin/food sensitivities. 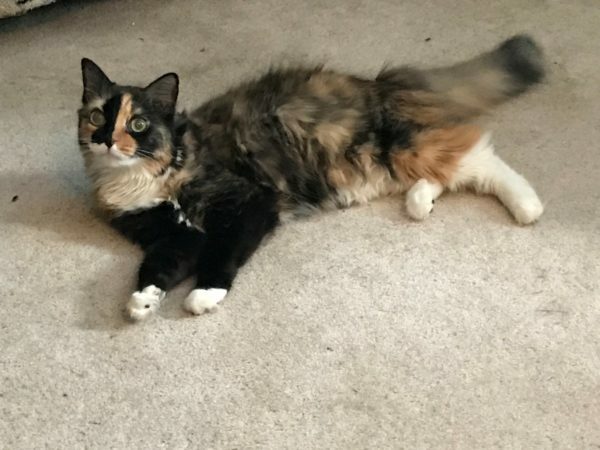 She is very loving and friendly, will greet you at the door and can’t wait for you to sit down so that she can purr in your lap. She must go to a single pet household where she can’t be tempted to eat other’s food and a complete indoor cat only.